AirCool 24 Review: How does it work? Is it worth the investiment? What is AirCool 24? Common fans do not change the air temperature, but they make you feel cooler helping to evaporate the sweat from your body. But for you to really cool down, you need a device that will lower the air temperature, like the AirCool 24. Designed for personal use, this little appliance is an evaporation-based cooler that uses a water tank to cool the air it blows at you. Most evaporative coolers are fairly large devices that look more like portable air conditioning units. 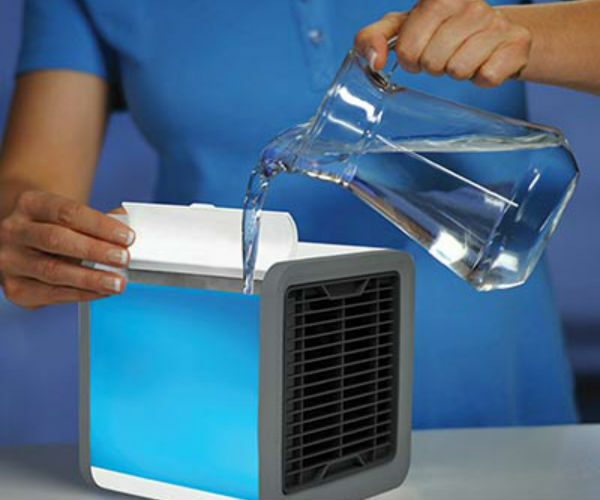 The AirCool 24 is a small cube-shaped cooler, measuring only 17cm x 17cm x 17cm, making it ideal to be placed on a desk. We evaluated a unit in white color, but there are also options in black and blue. As this is an evaporating cooler, it has a 750ml water tank aside. It’s a bit difficult to remove, but after a few refills, we figured out how to put the tank in and out without any problems. The water in this tank is absorbed inside the cartridge, spreading evenly over the surface of the cooling system. As the fan in the back blows hot air over the water, it evaporates, cooling the air and adding moisture to it. The water tank provides three to five hours of cooling and the cartridge can absorb about 400 ml of water; refilling when the cartridge is full extends the cooling time from one to three hours, totaling up to 8 hours of cooling. Controlling the AirCool 24 is easy thanks to the buttons on the top panel. Press and hold the center button the cooler turns on or off. Use the speed and temperature adjustment buttons. With 20 speed settings, there is plenty of room to offer between a gentle breeze to a burst of fresh air. In its default mode, the display shows the income air temperature, which is the temperature of your room. It also displays the outcome air temperature, which shows how efficiently the unit is operating. Tap the button once and you will access the main menu. This allows you to adjust the color of the water reservoir light – you can easily match your décor – and the intensity of the light; or you can turn off the light. With Night mode, the reservoir light goes out and the main screen darkens, so do not distract. There is an option to shine a specific color when the cartridge gets dry, so you know it’s time to refill. Once the cartridge has fully absorbed the water from the tank, AirCool can operate at maximum efficiency. The cooling effect depends on many factors, including ambient temperature and relative humidity. Evaporative coolers work best in hot, dry environments. AirCool has a useful guide that shows the expected performance of the cooler: at 25oC with 30% relative humidity, you can expect air output to be 15.4oC; at the same temperature but with 60% relative humidity, the outlet temperature is 19.7 ° C.
Testing in a room with an ambient temperature of 22.8 ° C and 53.2% relative humidity with an external meter, I left the cooler for the first time for 20 minutes to give the cartridge enough time to absorb enough water. When the cartridge was saturated, we measured AirCool output at 16.3 °C. 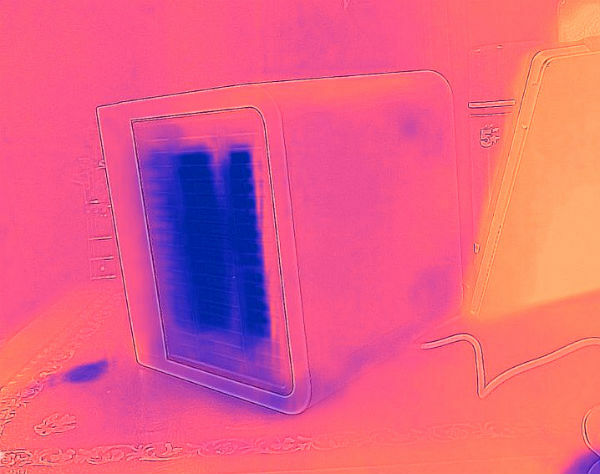 The AirCooler reported that the entry was 22.3 ° C and the outlet was cooled to 16 ° C. In other words, the sensors are very visible. You can see the cooler in action with the thermal imaging camera below: the blue part of the image is cold air. We measured the maximum air speed at 15cm to 2.1m/sec, dropping to 0.8m/sec at 1m. At minimum speed, the anemometer was not sensitive enough to detect airflow. Compared to a traditional fan, the AirCool does not exchange much air, but it does not have to. I found myself surrounded by a draft of cool air that refreshed me much better than a fan. Being too far away from the device means that you can stop feeling the maximum benefit. AirCool 24 was able to make my desk much more comfortable. Similarly, it is extremely useful for sleeping, keeping your body cool on a hot night. The noise is not bad at all; It measured 53.9dB at 1m with maximum power. At minimum power, the noise levels were 33.4dB, which is just the room background noise. The power consumption is excellent. According to the plug-in power meter, the AirCool 24 was consuming 2W at minimum speed and only 6.2W at full power. This is much less energy than an air conditioner would consume. The power consumption is so low that the AirCool is powered by a standard micro-USB cable, so it can opperate connected to your computer. Should You Buy AirCool 24? Testing the performance on a Summer Day with typical humidity levels for my house, I discovered that Air Cool was able to produce a much cooler airflow than the room temperature. It made my work environment more comfortable and, thanks to the way it works, so that I could still leave the windows open to breathe fresh air. Best of all, the running costs are extremely low. Air conditioners will cool an entire room and work better in high humidity environments, but require ventilation and are more expensive to buy and operate. 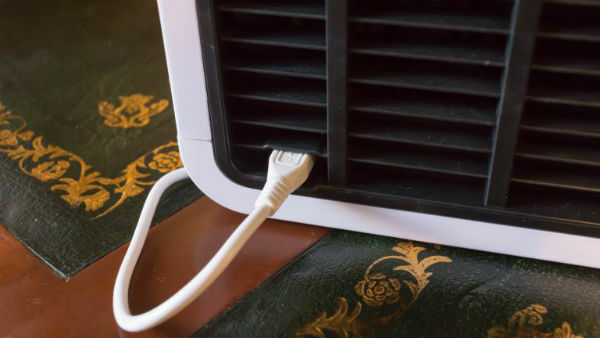 Common fans can cover a larger area, but do not affect the air temperature. 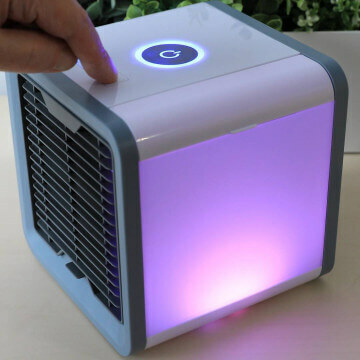 For common use, at a work desk or during sleeping, the AirCool is a great way to beat the heat and humidify the air in cases of people suffering from respiratory problems on dry days. Clean, compact, cheap, with simple controls and easy to use, the AirCool 24 is a great way to keep warmth away from you during your day or even during your sleep. We purchased AirCool 24 from the company’s official website, one of the largest distributors of technology devices abroad. The purchase was made without difficulties, quickly and in a safe environment. The device took about 20 days to arrive, and during the delivery process the company provided all information regarding delivery very fast.